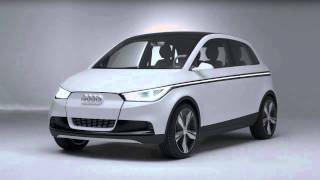 Audi A2 Concept is an all-electric four-seater concept car which will make its public debut at the Frankfurt Auto Show along with the 2012 S6, S7 and S8. 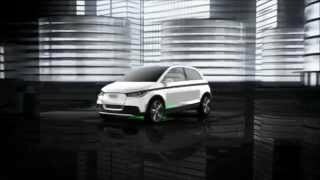 With the electric-only powertrain of the A2 concept, Audi is offering another peek into the future of electric mobility at the 64th International Motor Show (IAA) in Frankfurt. The technical study features a classic, premium-standard space concept that offers plenty of room for four people. 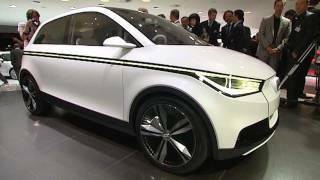 The Audi A2 concept is just 3.80 meters (12.47 ft) long, 1.69 meters (5.54 ft) wide and 1.49 meters (4.89 ft) high; even so, it makes an elegant, powerful and sporty impression on the street. Its clean appearance concentrates on the essentials; all details are subtle but shaped for visual impact. The dark glass roof of the white-painted show car switches to transparency with the push of a button. 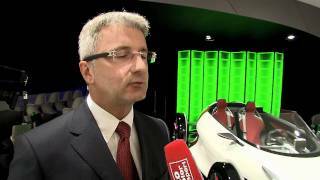 With its headlights, Audi is presenting the next phase in LED technology, known as matrix beam. A package of LEDs and microreflectors generate a high-resolution and non-glaring high-beam light. Delicate daytime running light fibers frame the highly efficient LED low-beam light module. Intelligent tail lights adapt their illumination to the visibility conditions. The rear fog light, produced by laser diodes, is seen as a beam of light in fog and projects a red triangle onto the road as a warning. The dynamic light runs below the edge of the window from the front to the rear of the A2 concept – a band of light that contains a multitude of innovative, dynamic light functions. Integrated approach sensors detect the owner and unlock the doors via gesture control. While driving, the dynamic light functions as a continuous side marker light. If the car’s indicator is activated, light impulses run throughout the entire band of light. 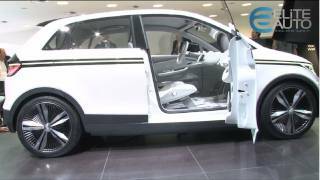 The Audi A2 concept has a flat interior floorboard. The center console is attached to the driver’s seat; the rear console extends forward between the two rear seats. The four individual seats add lightness, and there is storage space under the fold-up seat cushions. There is room between the rear seats for a city bicycle with its front wheel removed. The load area has two levels; a frame with functional nets creates the upper level. The colors and materials in the interior support the impression of lightness and functionality. The large areas from the door top shoulders to the floor bear a new and innovative covering material made of polyurethane with a neoprene surface feel; a ribbed material made from recycled polyester covers the central floor area. The seat shells are made with a plastic blow molding technique. Aluminum elements create highlights the cockpit.